For nearly three hours on Monday and for the second time in nearly two months, Fairhope residents railed against a proposed apartment development behind the Publix on U.S. Highway 98 at Parker Road. But unlike a similar meeting in early December, this time the Fairhope Planning Commission voted to recommend its approval to the Fairhope City Council. Residents from the adjacent neighborhoods of Sandy Ford, Rock Creek, The Woodlands and elsewhere pleaded with the Commission to deny the 230-unit, 39-acre “luxury” apartment complex named The Retreat at Fairhope Village. The developer, Leaf River Group, estimates the complex will contribute $225,000 in real estate taxes per year and $1 million in impact fees, water and sewer tap fees, and building permits. According to Leaf River President Stewart Speed, the complex will have one-, two- and three-bedroom apartments starting at $1,000 per month for a one bedroom. If approved, the complex will be located approximately one-fourth of a mile south of Rock Creek and approximately 1,000 feet from the northern edge of The Woodlands. The last apartment complex built in Fairhope was Arbor Gates, developed more than 20 years ago at the corner of U.S. Highway 98 and Gayfer Avenue. Area real estate agent Mary Cane said Fairhope needs apartment space for people who may not be able to afford to purchase a home in a town where the median home sales price in 2015 was $243,000 and the average price was $302,000. During his presentation to the Commission, Speed said the complex will be “upscale” and serve the city’s baby boomers, retirees, millennials, local workforce and some families. However, the complex will have just 20 three-bedroom units at a higher price, so he doesn’t expect a surge of new families moving to the area because of the complex. High Ridge Road resident Paul Ripp predicted nearby property values will fall and traffic will increase to a dangerous level if the apartment complex is built at the proposed location. The Retreat will be located just a few miles south of the Colonnade at Eastern Shore apartment complex currently under construction in Daphne. Speed compared the proposed complex to similar ones in coastal cities like Savannah, Georgia, and Charleston, South Carolina, but commissioner Hollie MacKellar said Fairhope shouldn’t compare itself to those places. MacKellar was the commission’s lone vote against approval. Commissioner Jennifer Filder said the city needs more rooftops to support the businesses at the Publix shopping center. She also said the city’s comprehensive plan is based around the “village concept” and this apartment complex is compatible with that plan. Some of the residents questioned why the apartment complex was being heard again after it was rejected 5-4 at the Commission’s meeting Dec. 7. City planning department attorney Chris Gill said at the previous meeting the motion failed by a 5-4 vote but no definitive action was taken. 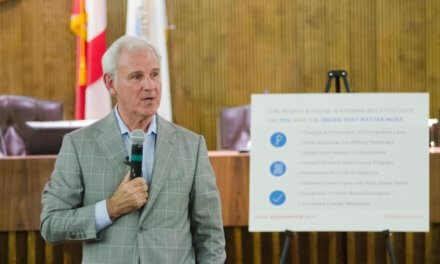 “The city of Fairhope has consistently acted in a way that the applicant always has the chance to withdraw the application before it is acted upon by the City Council,” Gill said. Some in the audience questioned why Councilman Mike Ford — who voted against approval Dec. 7 — was replaced by Councilman Kevin Boone, who voted for approval at Monday’s meeting. Commission Chairman Lee Turner said all city councilors serve terms on the Planning Commission and Ford’s term on the commission had recently ended.